For those of you who like pub walks, here’s a selection of my favourite pubs. Alongside walking one of my other hobbies is publising reports (unpaid!) for the Good Pub Guide. In an average year I suppose I do about 50 reports of which most of them are whilst I am out walking. I am often asked how I decide on a particular walk which I am leading- well- the answer is self explanatory! The only thing is that for my usual lunchtime stop my requirements are for good real ale or cider in the summer and quick and reasonably priced food. Therefore most of my pubs are certainly not ‘haut cuisine’ but should definitely have lots of character and above all be friendly to walkers. Regretably at the present time many pubs are struggling to survive and can often shut or change at short notice. I will try and keep these comments up to date but apologies for any changes in between my visits. If readers are walking in a group and decide to visit one of my recommendations then I would suggest a phone call the day before is always a good idea. The pubs below are mostly listed in pairs within the same area. The Goose and Cuckoo, Upper Llanover, Monmouthshire, East Wales. NP7 9ER. Tel-01873-880277. The Bear Hotel, Crickhowell, Powys, East Wales, PC NP 81BW. On the A40 between Abergavenny and Brecon this classic old coaching pub is probably more of a place to come after a good walk or better still to use as a base for several days walking in the Black Mountains which are close at hand and stretch up to 2500 feet in height. Firstly the village itself is a self contained gem with all the services a walker could need including other pubs, cheaper accommodation, a bank, butcher, baker, grocers but no candle stick maker! Back at the the pub the service is quietly efficient with three or four real ales and a large reasonably priced menu. They have three interconnecting bar areas which could seat up to a hundred but they also have a seperate smarter dining room for posh dinners. Nothing is too much trouble including water and snacks for dogs and tea and coffee also available at any time of the day. Apart from the main building there are also extra bedrooms out in the courtyard annexe. Local shorter walks could be up Sugerloaf Mountain (bit of a climb) or along and around The Brecon and Abergavenny Canal. The excellent Tourist Information office (about a minute from The Bear) has oodles of walking info. Map Reference: OS map EXP OL 13 or Landranger 161 ref 218187. (NOTE- The Goose and Cuckoo pub is about 30 minutes drive away via Gilwern and avoiding Abergavenny). 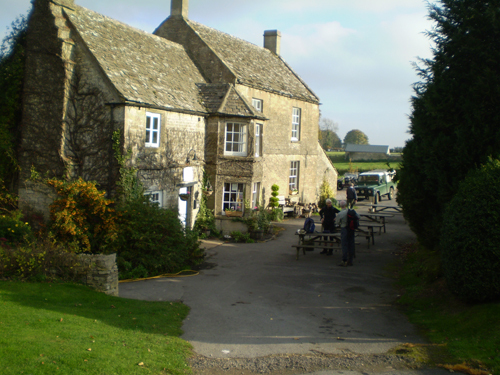 The Packhorse Inn, South Stoke, Somerset, BA27DU, Tel-01225-832060. Off the B3110 close to Bath, this lovely stone built pub goes back centuries and the village and locality above the Midford Valley is very scenic, The Long Distance Limestone Link runs along the valley which previously was also used by The Somerset Coal Canal and The Titfield Thunderbolt Railway line. There is also a circular (non listed) Long Distance walk all around Bath that comes through the village. I only discovered this pub a couple of years ago and have mostly enjoyed it in the summer out in the rear garden. The Somerset Cider is certainly good as well as local beers including Butcombe. Food is again simple but good portions and lots of choice from £5-£10. They also have a small Boules Piste although I tend not to carry my set when walking! Map reference: Pub OS EXP 155 ref 748613. Best direction for walking is from anywhere on the south side of Bath. Another old stone pub which is only about 3 miles down the same A417 road from The Five Mile House ( towards Gloucester) but nearest village is Brimpsfield which is attractive with lots of footpaths around. I was first introduced to the Golden Heart by my godfather and in a fit of youthful modesty said I would have a HALF of bitter. He then replied “your hands are too large to hold a half” The pub is an interesting contrast with the Five Mile House certainly a little more commercial with a very large menu and big portions and they also have three or four real ales and several ciders. Since it is right on the main road, in a big dip, it’s easy to drive past. For walking there are a lot of options with The Cotswold Way only a mile and a bit away at Birdlip village and I often walk out from my home in Leckhampton which is just outside Cheltenham in about 1.5 to 2 hours depending on which of many routes I take. A tale of three pubs! Before I started serious walking I was quite fanatical about canals but Sir Winston Churchill once said ‘Liquid History’ when asked about their future, which for me is very apt. However that was well before the great increase in tourism and The Severn and Thames canal tunnel ( one of the longest in the kingdom) has a good pub at both ends, and despite the canal being closed for over fifty years ( there are ongoing plans to eventually reopen it) the pubs still thrive. The Tunnel House Inn is just outside the village of Coates and approached by a narrow track through woodland. It’s been extensively remodeled in recent years but the original homespun bar is still in place with a reasonable selection of real ales and a large menu available in the bar or in the new restaurant. It can get quite crowded in evenings, sometimes with noisy Cirencester Agriculteral College students, but on a summer’s evening with tables outside, it’s all worthwhile! A great walk is to follow the Long Distance Monarch’s Way or The Palladian Way from Cirencester, although you can also walk through the Bathurst estate park and through more woodland to the pub. You could also follow the tunnel (on top!) to the other end and enjoy The Daneway pub which is very old fashioned and does simple food but serves several real ales. The attractive village of Sapperton is in between with the excellent and upmarket Bell Inn but then it could be a very hot day and you need more liquid! Map Reference: OS map (essential!) LR 163 or EXP 179 ref 965005. Some pleasant pubs here but Five Mile House may not be doing food. See their website. Still great place tho. Thank you for your comment. I have known about the non food position for some time but regrettably need to up date my site. It is now updated above. The situation is not as all stated on their website! In that they were apparently employing THREE different chefs for the food operation. The difficult location and problems for catering for any large parties is also a deterrent. Although the pub offered fairly good value there is still a problem in the upmarket Cotswolds where landlords are charging restaurant prices. I was recently walking up in Worcestershire and spent the night at The Lion Inn at Clifton on Teme. Shared B&B was £35 per head but rather better was the guest beer at £2 a pint and meals (depending on size ranging from £4 to £10. The landlady hailed originally from Lancashire and obviously still has the north country Value ethos close to heart! The place was packed out. I forgot to mention but Tea and Coffee was free to residents!